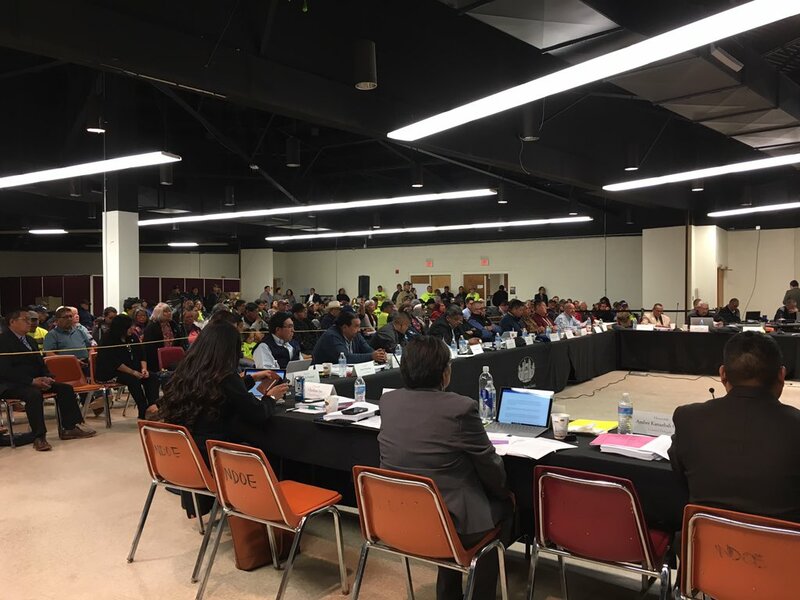 UPDATE – MARCH 22, 2019 – Yesterday’s meeting of the Naabik’íyáti’ Committee ended with a final vote by Navajo delegates on the proposed NTEC acquisition of NGS & Peabody Coal. Legislation 0044-19 failed with a vote of 9 approve and 11 oppose. March 21, 2019 – A big deadline looming for NGS and the coal mine in Kayenta… The Naabik’íyáti’ Committee special meeting today in Window Rock addressing the tribe’s potential support of NTEC’s independent acquisition of NGS and Kayenta Mine. During the meeting Council Delegate, Nathaniel Brown told the committee the Nation isn’t ready for NGS to shut down and that “Shinto, Kayenta and Page schools will be impacted”. Peabody Energy laid off about 40 miners at the Kayenta coal mine last month in preparation for the pending shutdown in December. That’s about twelve percent of their workforce. If the closure continues as planned, mine operations will end sooner than the plant because future stockpiles of coal to the site will no longer be necessary. According to AZCentral, SRP officials have said that “while they are not looking to profit from the sale, they do want to assure the utility and its shareholders won’t be liable for any unforeseen expenses if the plant is transferred to another owner”. SRP and other owners of NGS have reportedly agreed to put money in an escrow account to cover the cost of the eventual clean up of the plant if it is transferred to NTEC. NTEC is also reportedly saying they will provide a second clean-up fund as a “backstop”, offering to issue a performance bond to cover any potential cleanup liability costs beyond what SRP claims they will provide, the amount of that bond they are willing to negotiate. Negotiations stalled when SRP reportedly asked for full release from any further liability. Navajo leaders continue to say they are unwilling to offer that. Read more about the recent Navajo legislation here.